Summary: Brickhouse completed a wetland delineation on a 95-acre wooded property including a desktop review and reconnaissance followed by a full-site wetland and watercourse investigation. Brickhouse Environmental completed the wetland delineation of the 95-acre wooded property for the Chester County Economic Development Council. 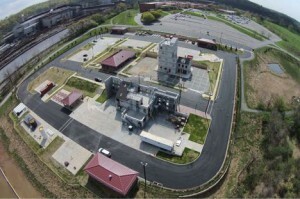 Chester County developed the award-winning Public Safety Training Center property for use in training first responders in realistic surroundings. An initial site evaluation, including a desktop map review and site reconnaissance, was conducted to assess the general feasibility of the project, followed up by a full-site wetland and watercourse investigation. The wetland delineation was complicated by the past agricultural and industrial uses of the parcel resulting in a complex of natural wetlands and manmade topographic features. Brickhouse collected the requisite wetland data, field-flagged the boundary, and provided a detailed boundary sketch to the land development engineer for boundary survey. The Training Center provides classroom areas and a hands-on Tactical Village, opened in May 2015, for Fire, EMS, and Police professionals. I just heard from my colleagues in Philadelphia about the case. They had nothing but praise for the effort your firm contributed. Thanks for stepping up to this project at the last minute. Thanks Dave. Outstanding effort by you and your team in getting this done. I want to thank you and Brickhouse for your help throughout this process. I will recommend you to everyone that requires environmental services. Your company is truly professional. Thanks again. Dave Farrington and Brickhouse have worked with Action Manufacturing Company as consultants on our Environmental projects with excellent results. Thanks so much for your continued great work on this project. We are impressed with your work. Thanks Michael, you did a fantastic job on this report, and made my life a lot easier. Thank you very much for your assistance in my tank removal project. Your managers and field crew were a pleasure to work with. Thanks for the status updates, I got out there as they were working on the newly uncovered well. Nice guys out there, personable and professional. Your work has been excellent and I will be very happy to continue our relationship going forward. Thanks Paul and company, great job. You did an absolutely incredible job. I am so impressed by the level of detail in the report. Thank you so very much. We officially sold the home. We thank you and appreciate what you have done to ease the transition. Your expertise is duly noted and it was nice working with you. It was a pleasure working with you guys… I will definitely call again when we run into any environmental issues on our projects. Your field staff were awesome. Steve is especially sharp and communicates well with the client and attorneys. The whole crew inspired confidence, and made a strong impression that Brickhouse is a quality outfit. – Sam C. and Mark R.
The loan went through! Thanks for all that you have done for us, you did an amazing job!!! Excellent job to all at Brickhouse! Yet another successful project, nice work! Thank you.